I will spoil the ending right off the bat... I am back at GOAL weight!!! 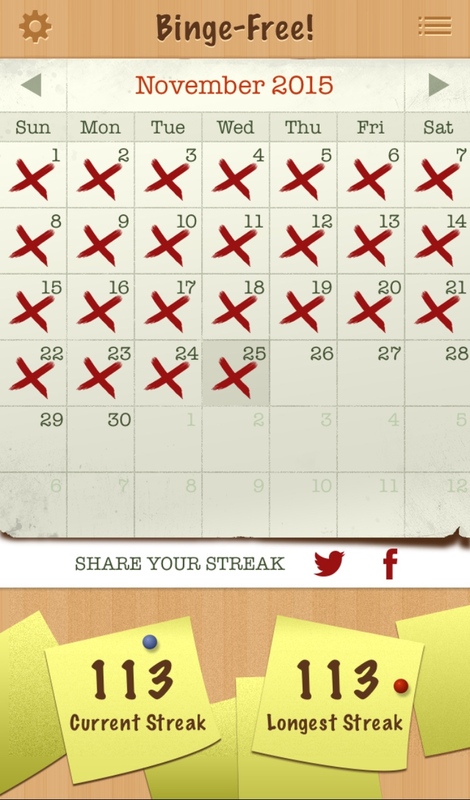 Fifteen short weeks ago, I never would have guessed that I would hit my goal so soon. I am so glad that I decided to give the calorie counting a good hard try, because it turns out that it works well for me and I really enjoy it. Not in a "I hate it, but I still do it" kind of way... but I actually kind of enjoy calorie counting. Probably because I love numbers, and (as of now) calorie counting is still fairly new to me. Anyway, today I was down 1.5 pounds from last week, bringing me to 133--my "official" goal weight. My body fat was 22.7%, which is down 0.2%; and my waist remained steady at 25.75 inches. (Because someone always asks, this is the body fat analyzer that I use.) As of yesterday, I was at 133.5 pounds, so I wasn't sure if I was going to hit 133 this morning; but it was a very nice surprise to step on the scale and see that I actually did it! I keep thinking of the phrase "Just get it over with" that my friend Andrea discussed with me when she visited in January. I wrote a post about it, but basically, she said that we spend SO MUCH TIME of our lives fretting over losing weight (particularly when we've gained some back). It consumes our thoughts day after day--some of us for YEARS (I worried about it nearly my entire life). 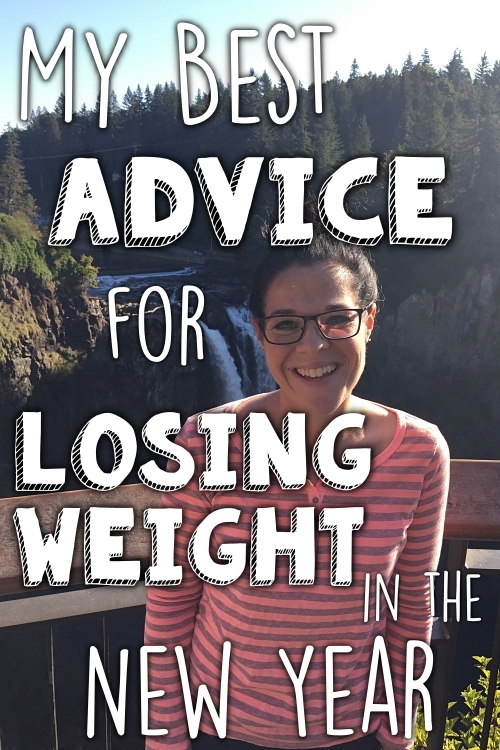 But Andrea said if we just get it over with (spend the weeks or months or couple of years it takes to lose the weight), then it's done--we don't have to constantly worry about losing it! I spent all of 2014 feeling like a failure for gaining some weight back, and I felt an enormous pressure to take it off. I was very hard on myself. I tried to make peace with my new weight/size, but I never felt really good there. For the first half of 2015, I was trying to lose it, but not to the best of my ability. My weight went up and down, gradually climbing to the highest it'd been in five years (since I lost the weight in 2009-2010). I'm not sure exactly what clicked for me when I started counting calories, but I became super motivated to get the weight off and get back to goal. It was like I put blinders on and just focused on the goal in front of me. In retrospect, I wish I had done this in 2014 right after gaining it! If I had just gotten it over with then (it took all of 15 weeks--not much time at all in the grand scheme of things), I could have saved myself from the mental torture that I put myself through for a year. Getting back to my goal weight wasn't "easy", even though it may seem like it was, based on how quickly I got there... there were some days where I was SO TORN about whether to binge. I knew it would have made me feel better in that moment to binge (only to feel terrible about myself afterward), so it was really hard to make that decision not to. But, as of today, I am 113 days binge-free! I'm the first to admit that losing weight does not equal happiness; but freeing up all that mental space that used to be consumed with guilt or feeling like a failure has done wonders for my happiness. I feel really, really good right now--not just with how I look, but with how I feel mentally as well. I decided to reward myself by booking a trip with my SkyMiles... I'm going back to the Pacific Northwest in April! This time, I'm going to spend a few days in Seattle with my friend Laurel (who is a blog reader that I met when I went to Portland!). Ever since I went to Portland, I've been dreaming about visiting Seattle; and since the two cities are pretty close, I can do both in one trip. I'm going to do a 10K in Washington on April 10th, and I'm making that my goal race for a PR. It's nice to have a race to plan for! It makes me even more motivated to get faster (and maintain my goal weight). So, now, the big question is... what's next? I clearly don't want to regain the weight, so I'm going to continue to count my calories. I'd like to maintain a weight below 135, so I'll have to experiment with my calories to find out what will make me maintain. I wasn't sure if I should continue to do Wednesday Weigh-ins, because I expect my weight to go up and down by a couple of pounds each week; but I think I will continue to post them. I won't do my body fat and waist measurement every week, since I don't expect that to change much, but I will continue to post my weight. I know I should say this more often, but I want to express a huge thank you to those of you that have stuck with me through this never-ending journey of mine. I try to post about the good AND the bad, the ups AND the downs, to give a realistic picture of what weight loss and maintenance is like. I've had lots of crazy ideas, and set some silly goals, and changed my mind dozens of times about what I'm doing... but each thing I do is a learning experience. I've gotten SO MUCH SUPPORT from so many of you, and I can't thank you enough for that! Considering tomorrow is Thanksgiving, I just want to say a huge THANK YOU to all of you for the kindness and encouragement over the last four years. That said, I hope everyone has a fantastic Thanksgiving tomorrow! I'm looking forward to doing the Turkey Trot with my brother, and then making dinner for my family. YAY! So excited for you. Way to set a goal and go for it. Now I will be excited to see your 10K training journey. Yay Katie! I recently saw an important number in my own weight loss journey - the weight I was when I got married 26 years ago. I am so happy for you reaching this milestone in your own journey. Happy Thanksgiving! How did you decide on your weight loss calories? Did you just follow what MFP recommended? Did you eat back exercise calories? Or did you add in your fitness level before calculating? I'm trying to get back after a regain and I've overwhelmed myself with so much information I don't know how to go back to basics. How ridiculous is that?!?! Thanks Katie. I had a system that worked but go so overwhelmed by feeling like it wasn't good enough that I messed up what was working and then gave up. Now my body is fighting me every step of the way. Congratulations Katie! I live in the Seattle area and it'd be a dream come true to just meet you and shake your hand. 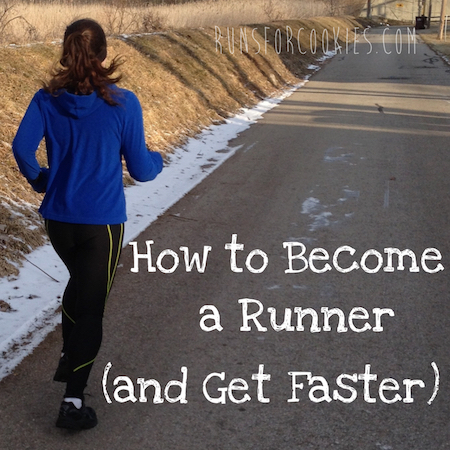 What 10K are you planning on running? Maybe I can make it a goal of mine to attend. It would be my pleasure to meet you in Seattle! The 10K is pretty far away (I'm going to Portland for a few days, and will do the race from there, then I'm going to take a train to Seattle for a few days). I'll try and come up with a meeting plan for anyone that may want to join us as well :) Send me an email, and we can work out the details! Congrats! I get consumed by the # on the scale too. 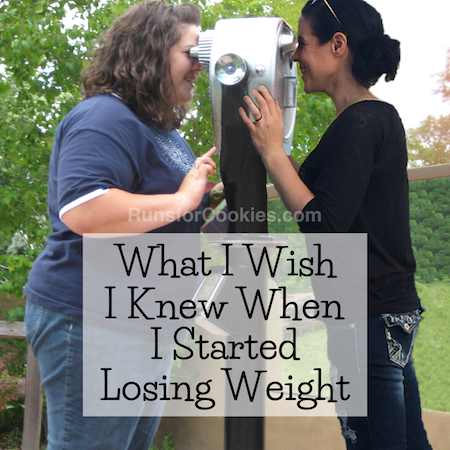 I just want to be able to go without weighing in b/c it totally consumes me and I often feel like a failure. I'm going to attempt the Turkey Trot tomorrow morning but it will depend on weather. Congratulations! Great Job. So happy for you. Happy Thanksgiving. Congrats!!! You look fantastic! On a side note, I've noticed you've been covering up your tattoo, are you getting it removed? Happy Thanksgiving! Thank you! No, not getting it removed (I wish! ); I have been covering it because I was getting emails suggesting that I get my "mole" checked out because it looks like it could be melanoma ;) It's easier to cover it than to keep explaining it's just an old ugly tattoo! Congratulations Katie! I know what you mean about just putting your mind to it and getting down to business. I have been working on losing weight for over three years now, lost the first 30 pounds pretty, well I don't want to say easily, but they were coming off. I got down to 176 and then I fizzled out. I spent about a year and a half somewhat maintaining around the 180 - 190 point. This past August I was so discouraged because I was back up over 190 and felt like I was going backwards. Then like you, something just clicked. I bought a fitbit and got back to calorie counting and just started being super diligent and consistent. And I've been losing about a pound and a half weekly ever since. I recently got into the 160s which is the lowest I've weighed in over 25 years! My first goal weight is 160, which honestly when I set that goal I was not sure I would ever see and now I'm thinking I could be there by early January. I may actually set a new goal at that point but we'll see. Anyway, congratulations again on reaching your goal and I'll be interested to hear how it goes with maintenance! You look absolutely incredible! What an inspiration you are Katie!! Happy Thanksgiving and thanks for always sharing! Congratulations Katie! I'm a long time reader of your blog, but first time poster. 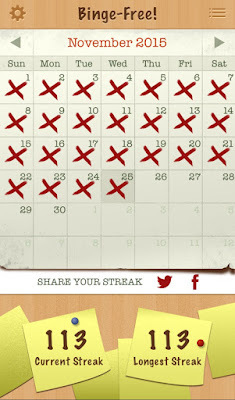 I think it's so great that you've gotten back to goal and that you've had such a long binge-free streak that I just had to say congrats! I relate to your story in many ways, which is why I find you inspirational. 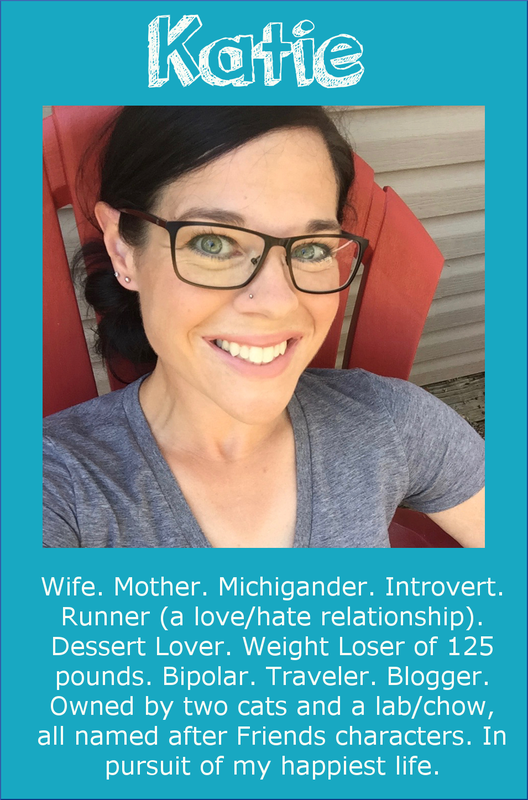 I love to run, but I've also struggled with my weight for several years, for the most part because I've suffered from binge eating disorder for years... But, like you, I haven't given up and I'm always going to try and better myself. I also have those days when I just feel this incredibly strong urge to binge, but more and more I get to be the one to win that battle. Right now I'm about 7 or 8 pounds away from goal, so this is not the time to mess up. Reading your blog reminds me that it can be done, so thank *you*. Yesterday I ran 10k for the first time in about a year and it felt awesome. Maybe I should also register for a 10k race in the spring :) I look forward to reading about your training. Congratulations! We both lost similar amounts of weight the first time around. I went from 251 to 134. But, I've gained almost 40 lbs back over the past few years. I've been enjoying your journey back to goal and you've really inspired me to get back to it as well. I'm down 2 1/2 lbs in the past 3 weeks. Slow, but steady did it for me before and I know it will again. I'm glad you're going to keep posting your weigh ins because maintenance is hard and I think that will be helpful for you. Congrats again!!! Woohoo! Congrats! You lost that weight so quickly! Amazing consistency and dedication with your calorie counting. You're a perfect example that if you just stick to the plan, you'll get the results! I've been a few pounds away from my goal weight for a few weeks already and I just haven't been able to lose them. 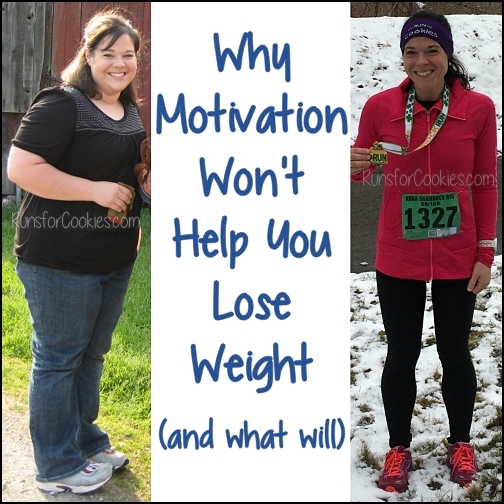 Your success is really going to motivate me to stick to my calories rather than going over "just a little bit" pretty much every day. Congrats Katie! What app do you use to track your binge free progress? I think that's such a helpful idea. I think it's just called "Streaks". It was a free app... very simple to use! Congratulations on getting back to your goal weight. You look wonderful. Congratulations again. I am proud of you for sticking to the calorie counting. Katie--congratulations!! Such a great accomplishment! Can you share what app you use for calorie counting? How you handle bites of food here and there--bites licks and tastes on WW! And how you count calories for recipes? Do you count the calories for every veggie you eat? Thanks!!! Congrats, Katie! Do you only run or do you do any weight lifting and/or core exercises? I just run right now (and walk Joey, but that's more of a stroll than deliberate exercise). When the weather was warmer, I was riding my bike, too. But I don't do strength training or core work or anything (I should, but I don't). Thank you for posting about the ups AND downs because it helps me when I'm experiencing the downs. 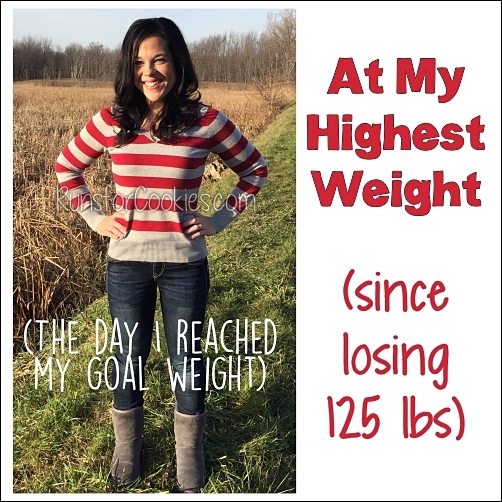 Congrats on making your goal before the holidays and please continue with your weigh in posts because that continues to inspire me in my weight loss and will help when I reach maintenance! Congratulations, Katie--I'm so happy for you!! Many, many congratulations! You are just glowing in that new picture!! I know the last year was hard for you. You deserve every bit of this joy! Amazing work!!! As always, what an inspiration! I saw this on FB, but finally have time to catch up on the blog. CONGRATULATIONS!!!! :) That seemed to happen super quickly actually - once you started the calorie counting. And it was consistent. It's encouraging. Way to go! Playing blog catch up but CONGRATULATIONS! should be so proud of yourself - especially with the binging - THAT is a massive accomplishment in itself.